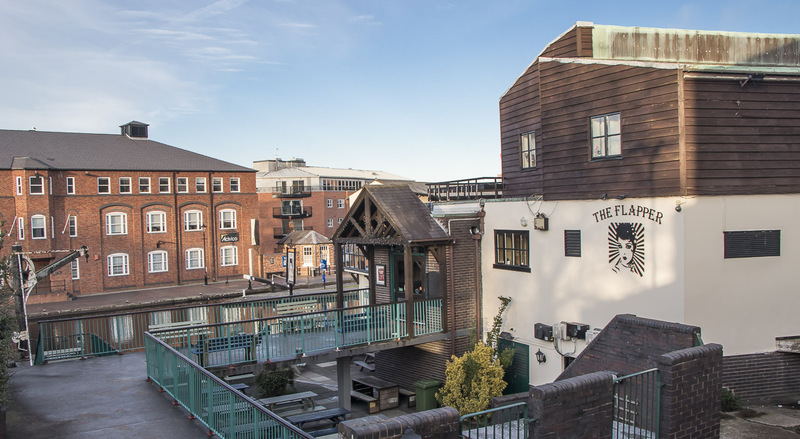 The Flapper pub by the canal at Cambrian Wharf near the Arena may be demolished to make way for an apartment development. Following pressure by local residents the original planning application was withdrawn last May. A new scheme is now being proposed by the owners of the pub. The original application 14 months ago was to demolish the Flapper and build 66 flats on the small footprint vacated comprising a three core block rising to 12 stories. Local residents opposed the development on the grounds of aesthetics, access, inappropriate design close to Grade 2 listed housing, neglect of the community wishes etc. 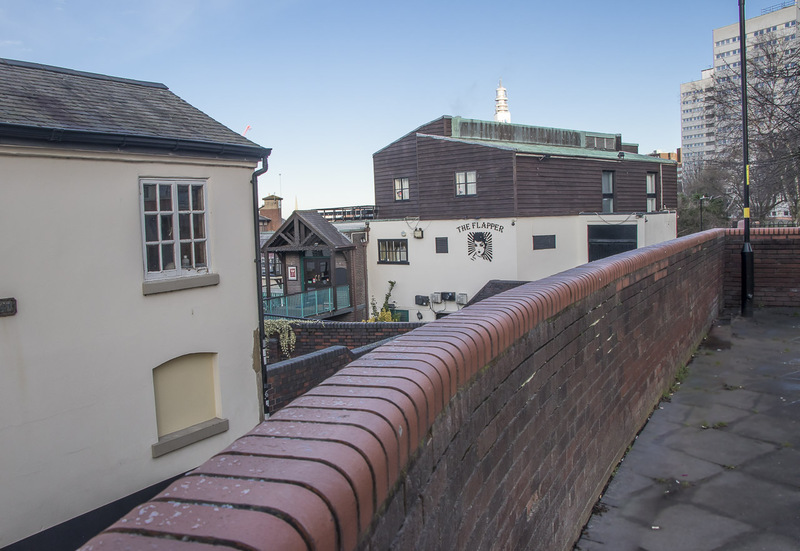 Baskerville Wharf (Birmingham) Ltd, owners of the pub, withdrew the application for revision on 1 May 2017 and extended the lease arrangements for the pub to June 2018. Will Adams, of development managers Whitehorse Estates Ltd, now appears to be in discussion with the planning department about a new scheme of 27 apartments on the same site ranging from 1, 2 and 3 bedroom flats rising to a maximum effective height of 5 storeys. Just before Christmas Mr Adams arranged a meeting with the residents of Kingston Row which is adjacent to the site and where all 6 properties are Georgian Grade 2 listed. This was to discuss his outline intentions. Residents say that the development proposals were considerably more aesthetic and sympathetic to the surroundings, but are awaiting the submission of the revised plans before making critical comment. In the meantime, the pub continues to trade and hold music events, which residents say have little impingement on them. Nothing has been presented to the many residents of the nearby Civic Close estate. Such developments can attract a payment to the Council under the Community Infrastructure Levy (CIL) to help fund the infrastructure, facilities and services – such as schools or transport improvements – which are needed to support new homes and businesses in the areas. However, the levy does not have to be spent on the area surrounding the development. A local resident believes that “the CIL would give considerable benefit to the residents of an area that requires considerable attention after many years of authority neglect. …… the estate received a Civic Trust Award in 1969 with the pub having a commendation in 1970”. 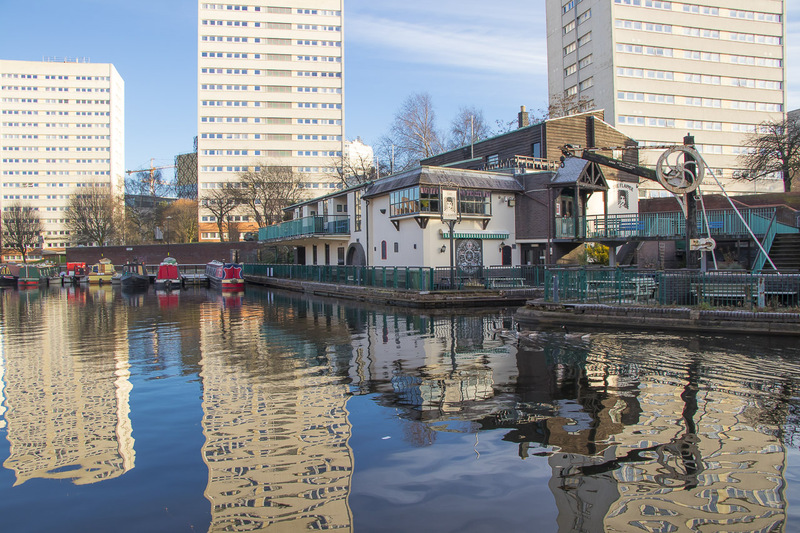 The pub lies at one side of the Cambrian Wharf, a picturesque canal area near the city centre with moored canal boats on which people live. The Birmingham and Fazeley canal runs through the wharf and includes the No 1, Top Lock of the canal. 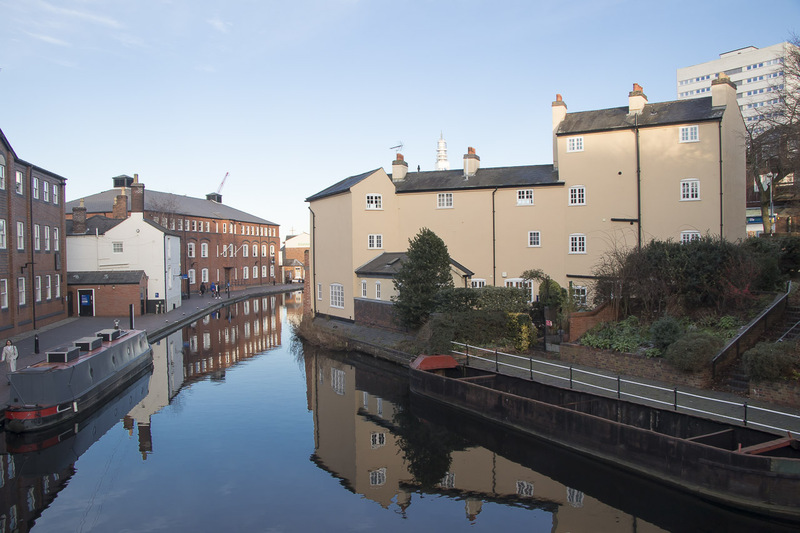 This is a popular place for touring canal boats to visit and is near to the dining and entertainment districts of Brindleyplace and Broad Street which are nationally known. 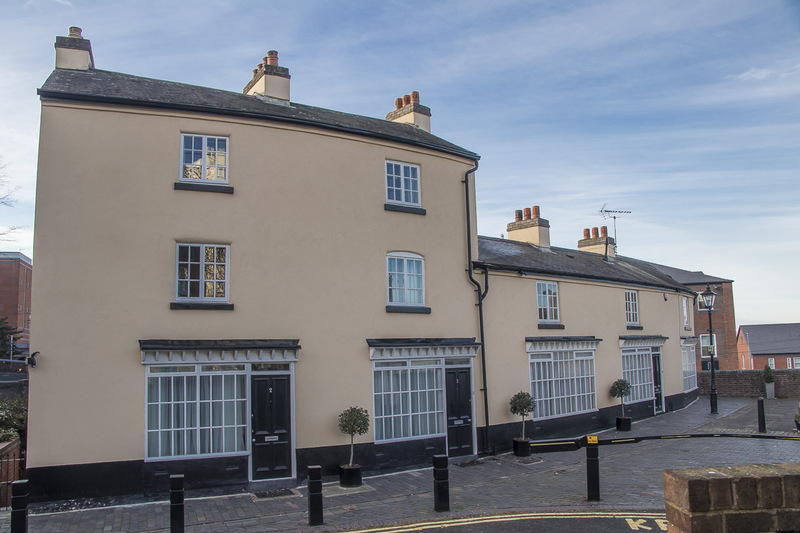 The area is very attractive and contains historical features, so the appearance and scale of any new development needs a deal of thought so as not to detract from this historical area. 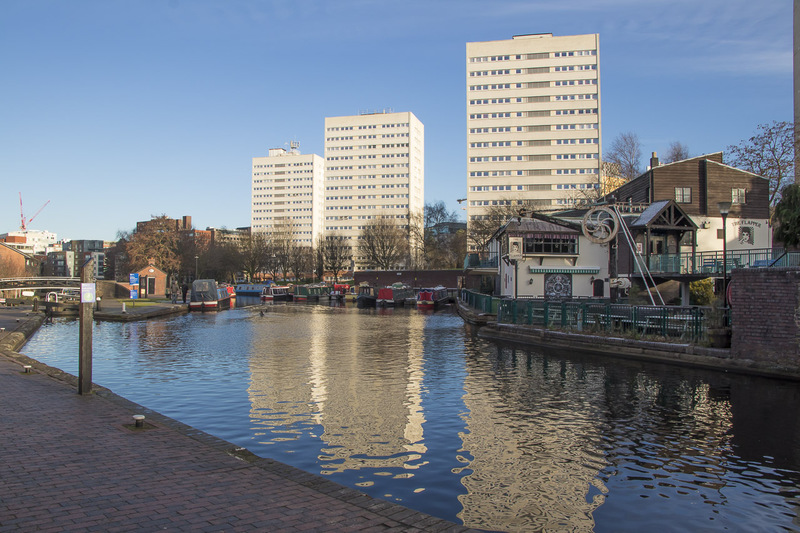 It enhances the character of the city centre and reflects Birmingham’s industrial heritage which relied on canals to supply raw materials and ship out the locally manufactured goods. 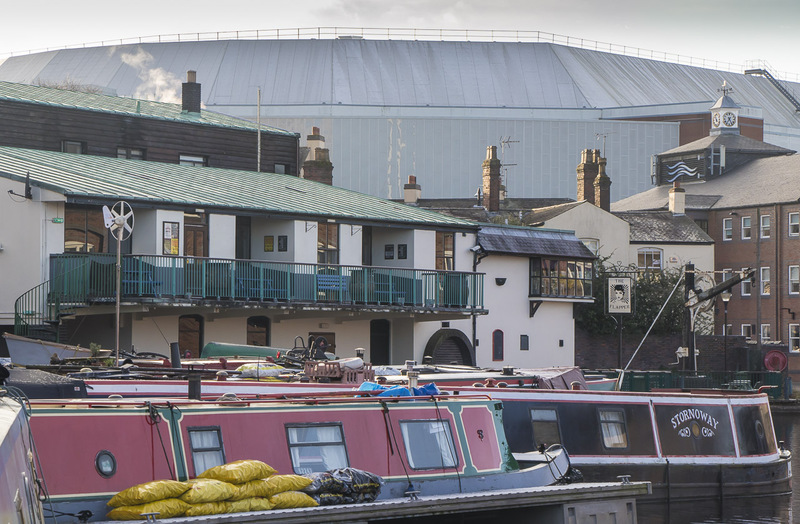 The pub also has a strong following from Civic Close residents, local canal boat residents, visiting canal boat cruisers and may others who love the views over the canal, especially on a sunny evening in the superbly placed outside and balcony areas. The musical events are also well supported. Please give your comments which can be entered after the Gallery below. This entry was posted in Uncategorized on January 28, 2019 by Geoff Caine. Just what Birmingham needs , another apartment block that most likely the well off or at least we’ll paid will be able to buy/rent. There is no need to develop the area and lose the heritage. There will be disturbances to the residents already living there and there will be pollution into the canal disturbing and ultimately killing wildlife. Another live music venue under threat. There won’t be any original long standing venues left in Birmingham at the rate. Why do something that the residents and the public don’t want? Do we ever have a voice or are we ever heard? I have no argument with development as long as it is done with sensitivity. Cambrian Wharf is part of the canal heritage of the city and any developer should be asked to take this into account. The Arena did that, in consultation with local residents. The result, although not to everyone’s taste, does enhance the towpath and provide a very pleasant seating area. The Flapper is the lifeblood of the area.Vibrant,social atmosphere.We .We must treasure it .We are so lucky to have this excellent venue. I dont know if the new development will be a lucrative investment in the future. Massive disruption to many residents,who have enjoyed many happy years ,of living in the area. 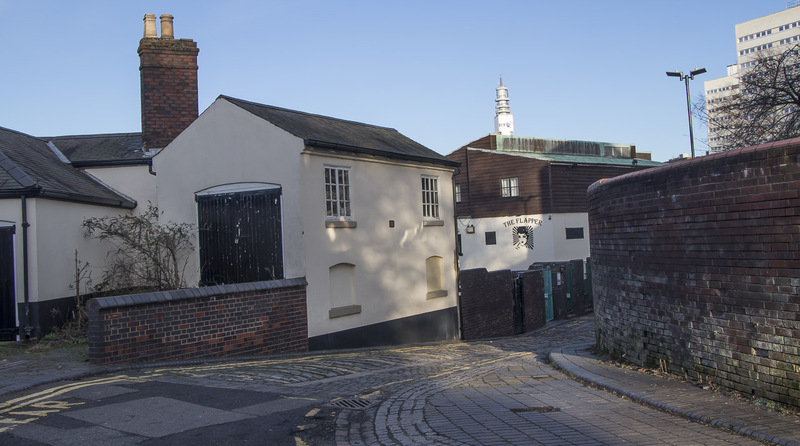 It is a precious part of Birmingham’s industrial heritage. Why can’t they leave the pub alone? How many live music venues do they wanna get rid of? We should be embracing our heritage for music not tying to crush it and build more apartments for hipsters. Just another greedy developer anxious to fill his gravy jug from the pockets of the well-heeled by selling them little boxes or extracting from them extortionate rents. This is an area packed with history and already has a thriving community of boaters and working people. These flats will inevitably attract those who appreciate none of that – how long before the new residents are moaning about noise, or smoke from the boat homes under their windows? This Labour council has an appalling record of failing to protect its own workers, never mind residents, and I say that as a Labour voter. My fear is it will take the developer’s money and leave local people to deal with the consequences. Why Demolish a thriving business that will turn 50 years old this year. There are plenty of other plots of land across the city that could be used to develop even more apartments that this city doesn’t need. With all the development around the city already, this area is peaceful and as a city centre resident I feel it should not be touched. The Flapper is also one of the last remaining grass roots venues in the city where young bands can earn their craft..as a frequent live music attendant I would be sad to see this place go. With so much history to this particular area. It should be preserved and not demolished for empty apartments nobody wants. A message to the “Realist” at the bottom of the page… and any other developers. The Flapper has never looked better and has been looked after to an exceptional standard by the current management team. I am proud to call it a home as a fan of music and is full of good friends to drink with. I look out of my office right now across Birmingham and see thousands of Windows and potential spots for people to inhabit. We don’t need any more but thanks for the offer!!! The site should be restored as it is. There are plenty of already empty buildings in Brum that could be demolished and turned into accommodation. There are countless places already being built/planned which contain hundreds of apartments. Why spoil a site like this, just for the sake of one small apartment block. It’ll ruin a picturesque area. And as for whoever made that first comment on here, about the pub looking semi-derelict… They obviously walk round with their eyes closed. The pub looks to me like it’s had a lot of things done over the last couple years and looks a lot fresher these days. And although as that person states – there are already a lot of pubs in Brum – I wouldn’t say it’s ‘awash’ with them… And not all pubs are the same, I don’t know of any other pubs in Brum that can match the flapper… It’s an important part of Birmingham’s rock/indie/alternative scene… Which Birmingham is slowly loosing when it shuts down venues such as this!!! Plus from what I’ve learnt, the locals that are supposedly in support of the new plans, haven’t actually said that they are! There are hundreds of new apartments being built within spitting distance of the flapper and some of the blocks already there are not even full. Taking away a pub that has supported the local music scene for many years is taking away the opportunity of local bands to ever play. Taking away the opportunity of the music from Birmingham to grow. Not only does it provide a great docking space for the boating community on the canal it is a hub and lively bar that is always full of friendly faces. The fact the council are even considering these plans again after them being withdrawn due to public demand last time is an insult to all the hard work the community put in to stopping it last time. We do not need more luxury apartments in Birmingham. This development is purely about greed. It will not provide housing for those who really need it. It will do nothing to enhance the area. The Flapper is a thriving pub and music venue. For years it has been vibrant centre for people of all ages to meet. Mr Adams bought the site purposely with intentions to bulldoze it. The Flapper should be renovated, for future generations to enjoy. Not destroyed for profit and an elite class of residents to move in. Another example of gentrification that is sadly taking over many parts of the city centre. In response to comments by “Realist” (or are you really Will Adams) have you ever actually ever been in the pub, or do you always walk past? If you had been in you would discover it is far from derelict. It is more than a pub, it is a vibrant music venue that attracts bands and fans from all over. It is family. Whilst I agree the City needs more homes, it needs AFFORDABLE homes. How many of these new flats will be affordable? None I guess. We have more need for our cultural heritage. Birmingham is The Home of Metal and the Flapper provides a starting based for up and coming bands. We need to preserve this. Whenever I have walked past this pub, it looks semi-derelict. It has suffered from the lack of an easy link from the opposite side. However, times have moved on. The city centre is awash with pubs, but we desperately need extra housing. Also, we must accept the need for high-rise buildings, or concrete over even more of our green belt. It’s time for change.